Home / Unlabelled / CELEBRATING IGBARIAM 2018 NEW YAM FESTIVAL: _THE MOST DECORATED & CELEBRATED NEW YAM OF THE CENTURY. CELEBRATING IGBARIAM 2018 NEW YAM FESTIVAL: _THE MOST DECORATED & CELEBRATED NEW YAM OF THE CENTURY. Sunday, Sept 16, 2018. 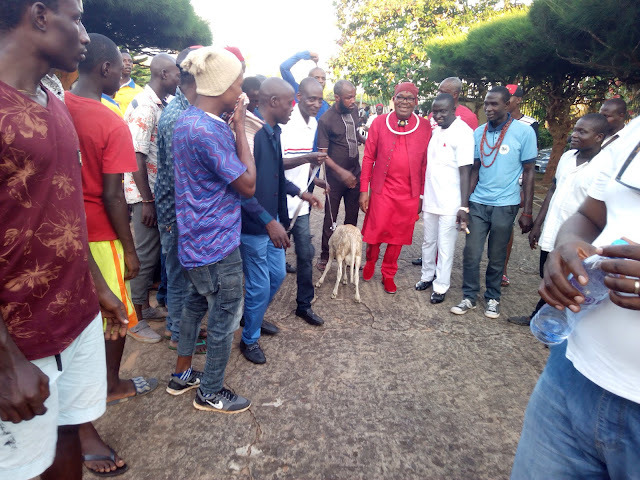 His Imperial Majesty, Eze Dr Nkeli Nzekwe Kelly, Okalakwu of Igbariam Kingdom, recently hosted his annual New Yam ceremony in Igbariam, Anambra State. The event attracted prominent personalities within and outside the country. The Executive Governor of Anambra State, H.E Chief Dr. Willie Maduaburochukwu Obiano, represented by his Special Adviser on Chieftaincy & Town Union Matters, Hon. Bar. Veraqueen Okonkwo. His Imperial Majesty, Obi Dr Austin Chukwuezugo Ndigwe, MON JP, Eze Uzu III of Awka. HRM, Igwe Sir Dr. Kris Chinedum Onyekwuluje, Eze Nya 1 of Umunya. HRM Hon. Dr CNN Nwajiaku (JP), Igwe Gburugburu of Akpugoeze, Orji River Enugu State. HRH Igwe Dr. Amb. Patrick Okolo, Chukwu Nwe Eze 1 of Nsukka. Revrend Dr. Gbenga Ademuyiwa, AOCTRON Royal Bishop and General Overseer. HRM Oba Dr. Festus Adeyemi, Alakola of Akola Ijesha, Osun State. HRM King Solomon Chukwuka, Obi of Ite-Opu, Delta State. His Royal Majesty, Eze Dr. Oliver Ohanweh, Obi Gburugburu of Ehime, Isiala Mbano, Imo State. 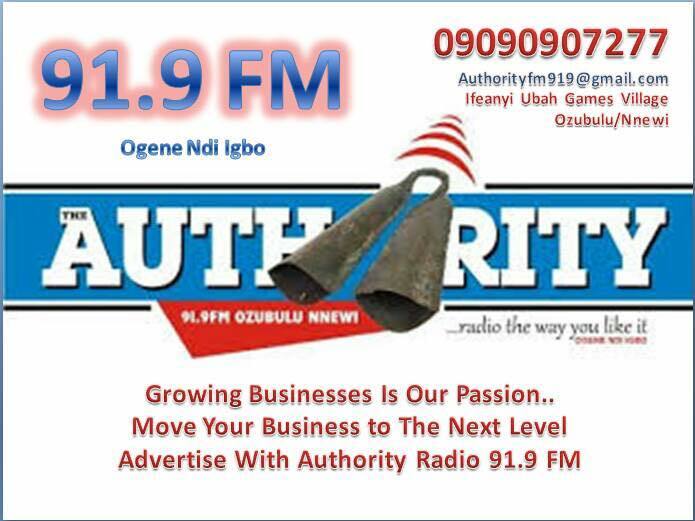 His Royal Majesty, Eze Dr. Douglas Okwara, Umuna Ancient Kingdom, Orlu, Imo State. HRM Ezenwali Alioma Collins, King of Olokpo land, Delta State. 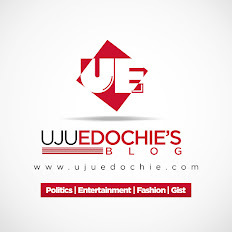 HRM Igwe Dr. Joel Egwuonwu, Eze Udo ll of Umuawulu. Crown Prince Nelson Okoye, Okebo ll Umueri. Chief Sir Lawrence Chukwunwuwa Anikpe, Onwa Igbariam. Chief Joseph Obudiegwu Udekwe, Ochiagha Igbo Gburugburu. HRH. Eze Ikenna Ozuome, Orsu Obodo Autonomous Community, Oguta Imo State. HRH Eze Nnaluo Sylvester, Igwe Orujemjem Eziagulu Aguleri. 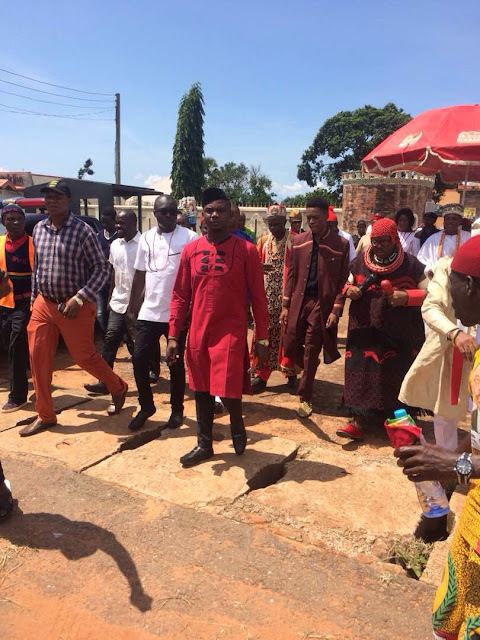 HRH Ezeuzu of Umuzi Orlu, Imo State. HRH Igwe Ajodo Joseph, Egashi Ukwala, Anambra West. HRM. 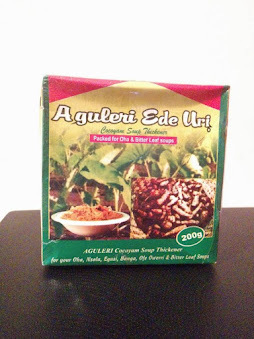 Eze P.U Ikegbune, Ojiuche Eziagulu Otu Aguleri. Engr. Simon Obidike, Onowu Ikem Ivite. Amongst other monarchs, endless number of Chiefs, Government functionaries, political appointees and aspirants, religious leaders, Presidents General, Youth leaders, artists to mention but a few. 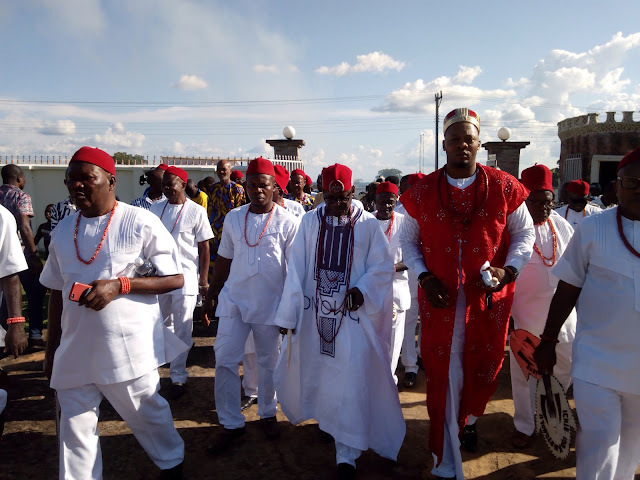 The characteristics of Igbariam people, which cover their language, religion, cuisine, social habits, music and arts, hugely resonated recently in Igbariam village as Eze Dr Nkeli Nzekwe Kelly celebrate his 2018 new yam festival. The colourful, entertaining and pleasurable ceremony began with a Catholic Mass celebrated at a Chapel situated at the expansive and roomy compound of HIM Eze Dr Nkeli Nzekwe Kelly, Reverend Fathers/Sisters, friends and family members joined at the Mass. Together they dedicated the celebration to God Almighty and thanked Him for a very successful planting season, which output they described as plentiful. The home kitchen opened as early as 5a.m. with a pack of cooks dishing out their different kinds of foods to all and sundry, who had come around to help fix the grounds for the day. The Grand Finale of this ceremony started the previous night with what looked like a night of eulogies. 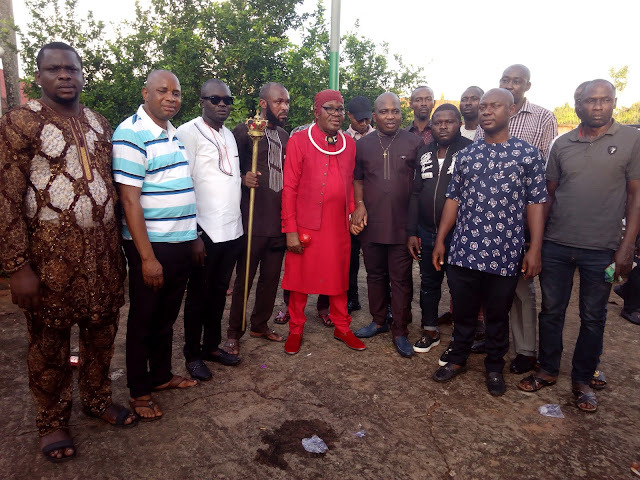 Many of his friends and associates gathered to pour encomiums on Igwe Okalakwu as he is fondly called for sustaining the IWA JI ceremony, which has become an annual event, hosted solely by him.. The night, which lasted into the early hours of the morning, was made cool with traditional Ogene music, which blared from a music system in the background. But on the day of the event proper, Sunday, the atmosphere changed. Dignitaries appeared in their traditional regalia. Chiefs, Nze, Ozo and other title holders appeared as demanded by culture. Everyone was welcomed by a mountain of yams that had been brought in for consumption. The happy people of Igbariam took to the floor, dancing to a cultural rendition by different Ogene troops. That prepared the ground for the welcoming to the stage of the chief host, HIM Eze Dr. Nkeli Nzekwe Kelly. A special group peopled by men and women, from Igbariam and beyond ushered him into the arena with a traditional music beat. He danced round the compound, waving to the huge guests with his OFFOR in both hands. While he had a Red offor in his right hand, he gripped a Black offor on his left hand. Interestingly, a religious leader conducted the oratory speech-making, eulogising and evoking emotions. After more than 40 minutes dance round the venue of the event "King Melchizedek Arena" to the admiration of the crowd, he took his seat. 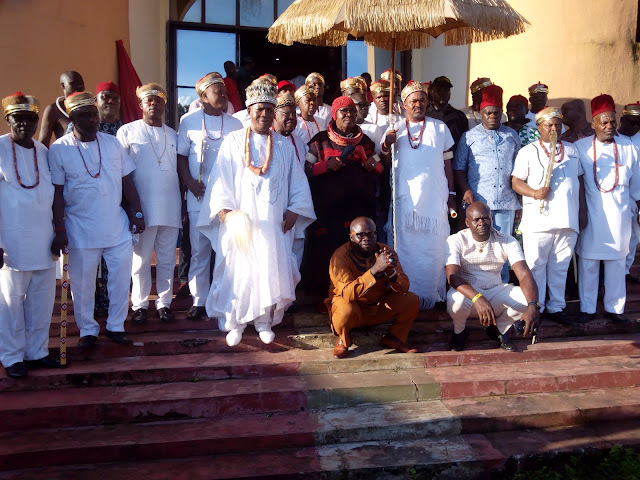 Igwe Okalakwu sat alongside notable leaders of Igbariam including Onowu and Odu Igbariam with his numerous cabinet chiefs by his left hand and other reputable monarchs by his right hand side. Igwe Okalakwu described the IWA JI as an important event that shows the richness of the Igbo culture. According to him, culture is crucial to the growth of the society, cautioning against taking to idol worshipping or anything that inhibits progress. As he broke the Kolanut, there was a resounding shout of Eze ndi Eze (King of Kings)! Long live the King!. in admiration by the huge crowd. His facial scrub mien showed he was ecstatic by the applause. Apparently delighted by the welcoming atmosphere, he went ahead to perform the Iwa Ji. Again there was huge ovation by the appreciative crowd. This marked off the proper beginning of the event. Masquerades of diverse sizes and makeup took over the stage. There was an elephant masquerade as well as the one locals call ‘Izaga, Ijele and Akanri’. Each tried to out-perform the other. The crowd gave a standing ovation and applauded those considered to be exceptional. The treatment was handed to the cultural dancing troupe that followed. The dancing groups were not from only Anambra, they came from five other states especially the Southeastern states. Each canopy had something to watch and comment on; there were those whose business was to blare the local flute, while others especially two women busied themselves with solo renditions. As these were going on, shots from cannon gun were let out intermittently. There was a contest by farmers who presented their yam produce before Igwe and the man who cultivated the biggest yam of the year got an instant reward of a Hundred Thousand Naira (#100,000). This was followed by the conferment on the Igbariam youth Leader, Mr. Sunday Ikem, the title of "Odogwu Igbariam" by Eze Dr Nkeli Nzekwe Kelly. 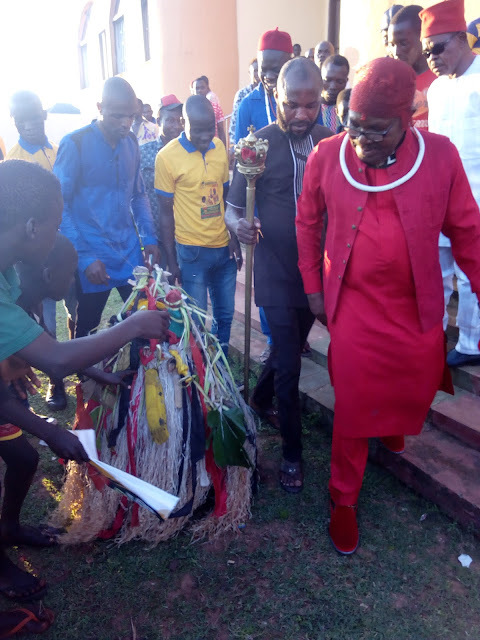 Talking about where he derives the inspiration for the annual event, the chief celebrant said that all positive inspirations come from God, he said he looks for what is good, what will excite people because the whole nation is moody. South-east is so downtrodden and its always in my mind, what is it that we will do to give hope, even if it is for one second, to bring joy? I believe in the saying that any joy that you bring to someones face, mind, heart, soul for one second, is worth a whole lot to some people who may never have had excitement. Our cultural values, our traditional values are impeccable. The ones I know about, the ones I grew up with, all the things that I knew as a child within our own traditional setting that you must not do that it is abomination; that it makes you look bad before people, those things are practically all the 10 commandments of Moses. African culture is not devilish. It is not in itself bad. But for a very long time, African culture was kind of demonised and given all kinds of names, perhaps because our own history as West Africans have been told severally by people who are not Africans. But the normal thing is that the owner of a particular story is the best person to tell his story. He said that New celebration is an occasion to give thanks to God for what he has done for letting his people go into the farmland to cultivate and at the end they came out with fruits of the land. Also by extension, it is a holistic opportunity to thank God, not just for farmers. There are some who do not have the opportunity due to the nature of their work to take part in cultivating the land like civil servants; but wherever one is working, that may be considered to be the person's farmland and whatever comes from it is a harvest of the land. The event lasted till night. 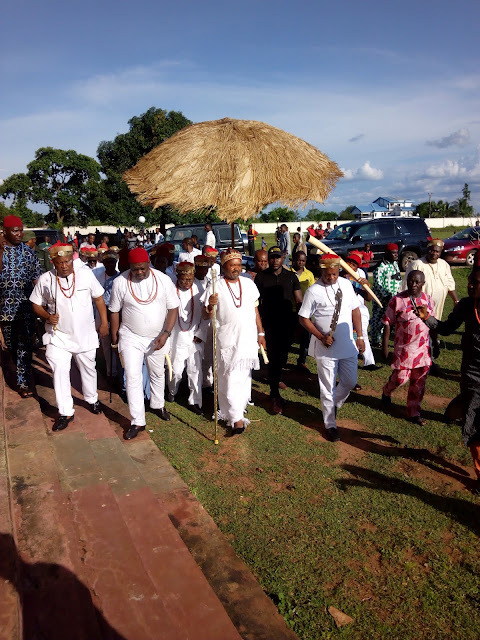 Igwe Okalakwu promised to sustain the event, as it promotes the cultural values of Ndi Igbo.